I just can't stop making blooms. I made this one with pink bias binding and the spark was the 'Pink Lemonade' Challenge over at the The Shabby Tea Room to use Pink, Green Neutrals and Flowers. I used the same method as here but instead of using ruffled ribbon I ruffled the bias binding myself with a running stitch along one side. I created the frame with some scraps of Amy Butler Sola papers that I'm eeking out - love the muted colours. This is just amazing. I love the way you make those flowers, they are fabulous. This is gorgeous, love that stunning pink flower!! Loving the blooms Vicky. Fab card, gorgeous colour scheme! Love this very much .. .. your flower is gorgeous. The scissors are amazing by the way .. .. not a piece of gunk in sight!! 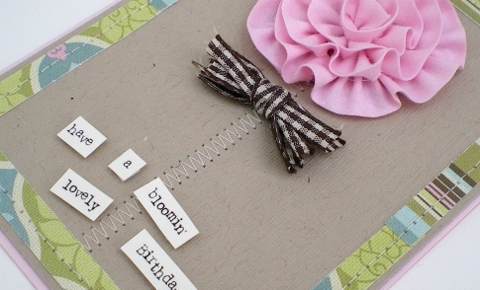 Gorgeous card, I love the stitched frame and the pink ruffly flower - bloomin' gorgeous!